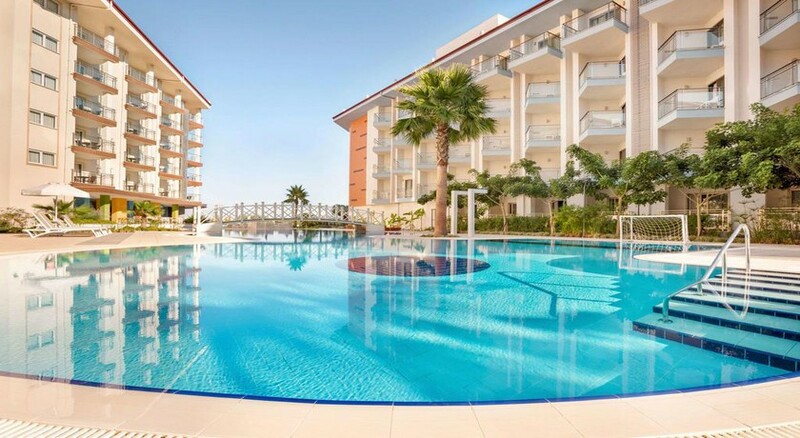 Amazing sea views and a perfect location make the impressive Ramada Hotel & Suites Kusadasi an ideal holiday destination for families and couples. This fun-filled hotel has everything that guests need for an enjoyable stay. From the outdoor pools and aqua park to the sun terrace and the on-site restaurants, guests are looked after from the moment they arrive. The lavishly styled rooms with an array of features guaranteed a comfortable stay while there are many activities and sport to enjoy including entertainment. 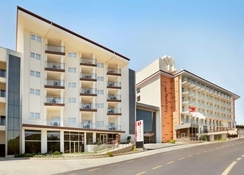 The Ramada Hotel & Suites is ideally located within reach of many top attractions and gorgeous beaches. Guests have the chance to make the most of this wonderful location. With one of the largest water parks in Europe on its doorstep, there is plenty of excitement to go around while keen golfers can take a trip to the 18-hole golf course. Kusadasi beach is just a short walk away and here guests can choose to soak up the sun or explore their wild side by trying out some of the water sports on offer. There are plenty of dining opportunities in the area and guests can grab a bargain at some of the shops on offer. This is a complex that is in a prime location, with sensational views and all that guests need nearby. The hotel is 64km from the airport. 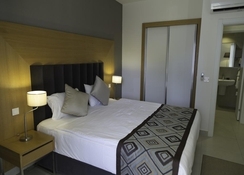 The hotel caters to all, offering a wide choice of rooms including Superior, Junior Family and Family Room. Guests will instantly notice the lavish and luxury décor and plenty of space for them to enjoy from the moment the door closes behind them. 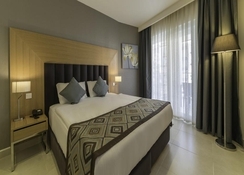 Each room comes equipped with an array of features including air conditioning, private bathroom, sofa, Wi-Fi, telephone, hairdryer, minibar, safe and a balcony or terrace. For those who stay in a Junior Family or Family Room then they can take advantage of a fully-equipped kitchenette. There is plenty of choice when it comes to dining at the hotel as the buffet-style restaurant is sure to take care of their every dining need. Here they can take their pick from delicious dishes for breakfast and dinner. 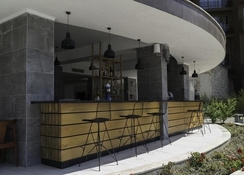 Light bites and refreshing drinks can be found at the snack bar and restaurant while there is an a la carte restaurant available for guests to take advantage of. If guests want something different then a short walk into the resort centre will give them a wide choice of restaurants and bars. The complex comes with two outdoor pools and a sun terrace for guests to enjoy while the on-site aqua park is ideal for spending a few hours riding the slides. For those who like to keep busy, there is plenty of choice as there are sports such as tennis and basketball as well as a fully-equipped gym. The spa has a range of facilities that encourage guests to wind down and take it easy while there is entertainment on offer throughout the day and night.